There are many hands that tend to get players into trouble or sticky spots when playing Texas Holdem. One of the biggest ones is pocket Queens. They are a very strong hand, yet many will play them too fast and only play the actual value of the hand ignoring the entire situation that may be building up around them. You can’t simply play Queens for their face value or you risk either losing a lot of money in a big pot, or not get the most value possible with them when you are winning. This article will discuss the important factors when you are dealt pocket Queens and how to use this information to decide how to continue with the hand. The first thing you want to take note of is the type of players at the table and in particular the opponent(s) that are involved in the current hand. The point to understand is Queens should be played based largely on what type of opponent you’re up against. If you have bet and are faced with a 3-bet re-raise from an opponent who hardly ever plays a hand, then alarm bells should be ringing and you have to proceed with caution, or possibly even fold your Queens if you think you might be up against Aces or Kings even thought this will be a rare scenario, it has to be considered. When facing a loose player with pocket Queens it may be correct to try and get the money in pre-flop. If you are facing a bet from a loose player who likes to raise and you have seen them get the chips in with worse, you want to do everything you can to do the same in this situation. You should always try to 3 bet (re-raise) when facing a bet from this type of player and look to call off the rest of your chips if they go all-in. If you are the one facing a 3-bet you have more options, but many of these will be advanced plays. If you’re still learning the game of poker its best to 4 bet and look to go all-in. Against a solid player, pocket Queens will be more difficult to play. Regular Players will not go all-in with less than premium holdings most of the time, but they will 3 bet and fold as a bluff. This is where you will need to take other factors into consideration. This leads me into……. Your place at the table will effect how you play Queens almost as much as the player you face. If you are first to act, you are obviously going to raise with a strong hand like pocket Queens, but you don’t want to bet a normal 3x big blind opening raise as this will likely get a chain reaction of callers. A hand such as pocket Queens plays best when heads up against a single opponent, they don’t like a lot of players in the pot as this increases the likelihood of an opponent hitting an overcard and reduces the odds of your pocket Queens holding up. To minimize the chances of getting called by all players at the table, your best option is to bet 4x the big blind when playing from early position. From any other position, a normal opening raise of 3x is fine. When you are facing a bet from early position with Pocket Queens, you will need to factor in what type of player this is to start. Most players, even reckless ones will not raise from early position without strong hands for the most part, but you still need to be aware of this. You also need to consider the fact that a player opening under the gun, will have a much stronger hand than if they raised from the button. 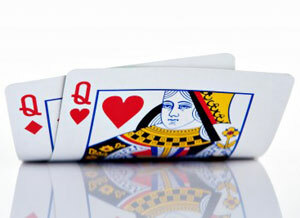 Many players will elect to re-raise with a hand such as Queens against an early position raise. This is usually a mistake, as it completely reveals your hand strength and can put you in a difficult spot if your opponent is holding an even stronger hand. A 3-bet against an early opening raise is a very strong play and is usually done with only premium hands. This is where the problem lies. By doing so, you are showing that you have a big hand and will only get called by a hand that has you beat or possibly A-K. The rest of the time, the player will fold and you only win a small pot. When the player does call or 4-bet, you are unlikely to be ahead and will mean playing the rest of the hand can be very difficult. If there is nothing over a Jack on the flop, you will likely be tempted to get the money in. Always beware of action when you have an over pair to the board with Queens in this situation. An early position opening raise, followed by a lot of betting on a dry flop usually means you are beat! Facing a bet from later positions at the table will be much easier to handle. You generally want to 3-bet since you have position, and the best hand a larger percentage of the time. Another reason to 3-bet is to stop others from calling you, creating a multi-way pot and not giving you the best position. Say you are in the cutoff position with pocket Queens and call a bet made by a player in middle position. The button now decides to also call and you are now sandwiched in the middle of the two opponents. You have given up your positional advantage to the player on the button and have to act between the two players. This isn’t an ideal situation when playing pocket Queens. There are times however that you should only call. If you recognise that a player always folds to a 3-bet, you may elect to just call and keep them in the pot. You can also call if you are on the button or cut-off, and there are 1 or 2 really bad players behind you. A bad player won’t use their position to make your decisions tough, so it’s good to keep a bad player in the pot hoping they will stack off with worse. Pocket Queens will require observation and practice to master them. You must take all factors into consideration when deciding how to play them. Playing Queens can be more of an art than a science. You just have to think what would be the best possible way to play Queens in this particular situation.